Posted 4:27 pm by Administrator & filed under News. 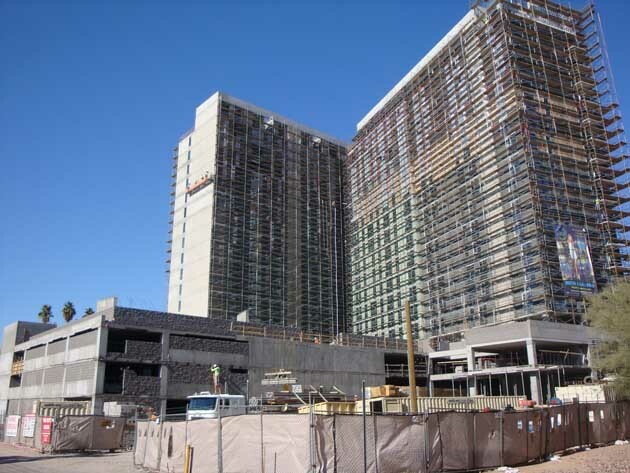 The Hub on Campus student residence has topped out in Tempe, Arizona, at 200 feet. HPA is the architect of record for the 19-story tower located at 323 East Veterans Way, within walking distance of Arizona State University’s Tempe campus. The 414,000 SF high-rise offers 269 upscale housing units with condo-style finishes and views overlooking Sun Devil Stadium and “A” Mountain. The building is comprised of two rectangular volumes, with enclosed parking and ground-level retail storefronts. The facade blends varying colors and patterns of transparent glass with colored stucco panels and exposed concrete. The cast-in-place concrete structure is post-tensioned to maximize floor heights within the units. Targeting LEED certification, the sustainability-focused development features outdoor terraces, operable windows and landscaping that optimizes shading. Pre-leasing is underway, with construction scheduled for completion in August 2013.